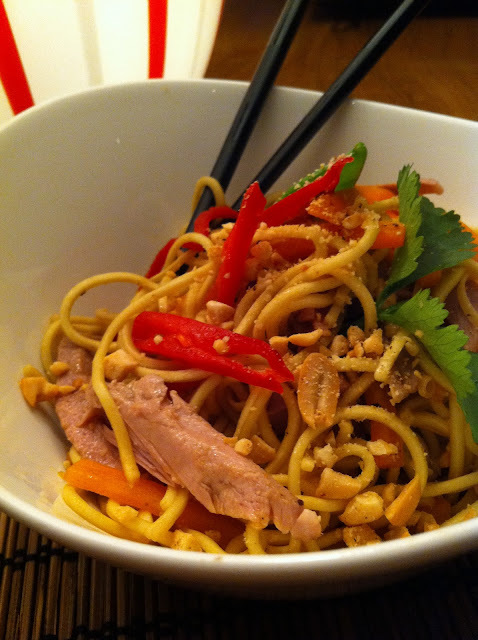 How about fishing out the chopsticks and venturing eastwards for an egg noodle supper? Why egg noodles in particular? Well no reason really apart from convenience - rice or "glass" noodles would do just as well - but in recent years egg noodles have become easily available with most supermarkets selling the vacuum packed ready to use variety. If you can't get these however try the de-hydrated types which just require either soaking for a short length in hot water or boiling and straining prior to adding them to the rest of the ingredients. The directions will be on the pack. The beauty of the ready to use brands is precisely that! They are ready to use. The down side is they have a limited fridge life whereas dried noodles will last almost indefinately. In 2002 Chinese archaeologists discovered an earthenware pot full of identifiable noodles over 4000 years old!! We don't recommend keeping them that long however. Probably best to observe the best before date! Mix the ingredients for the dressing in a small bowl ensuring the sugar is dissolved and set aside to blend. Taste and adjust if necessary. You are looking for a balance of sweet, sour and fragrance. Prepare the noodles as per pack instructions and put in large mixing bowl. Meanwhile blanch all vegetables apart from the spring onions. Drain and add to noodles with the meat. Add the Asian dressing and toss well. Turn into a serving bowl and sprinkle coriander and crushed peanuts over and serve.